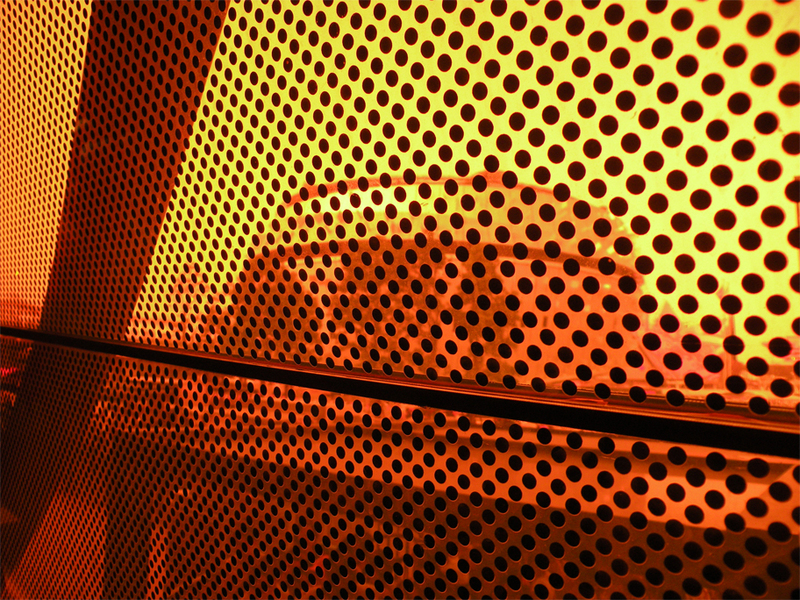 38 Degrees and Rising – Shanghai, China. “Flight attendants, please take your positions for landing.” The captain’s voice crackled over the aircraft’s PA system and we looked out the window, hoping to catch a glimpse of the scenery below us. Through the thick pall of smog only the faint outlines of fields and fishing boats were visible. 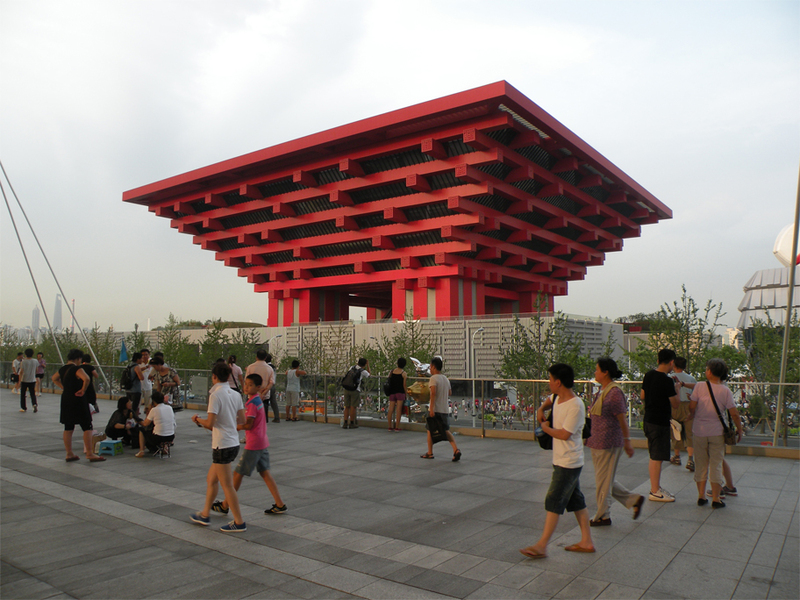 This was my third trip to Shanghai and I was here to see the 2010 World Expo. Titled ‘Better City, Better Life’, its focus was on green urban living. When we landed it didn’t take long for us to clear immigration and customs. The airport was clean and glossy; even the tiniest bit of litter was picked up by attentive cleaners. After a short 10-minute ride on the Maglev Train we emerged from the protective canopy of Longyang Road Station. I had heard about the August heat in Shanghai but this was far beyond my expectations. It was at least 38 degrees Celsius, and the humidity was staggering. In the sweltering midday temperatures I could feel myself baking under the sun. The conditions at the Expo site were not much better. In order to get anywhere you had to cross six-lane avenues and vast expanses of concrete. Apparently someone thought it wise to design everything on a monumental scale, forcing everyone to walk great distances in the terrible heat. 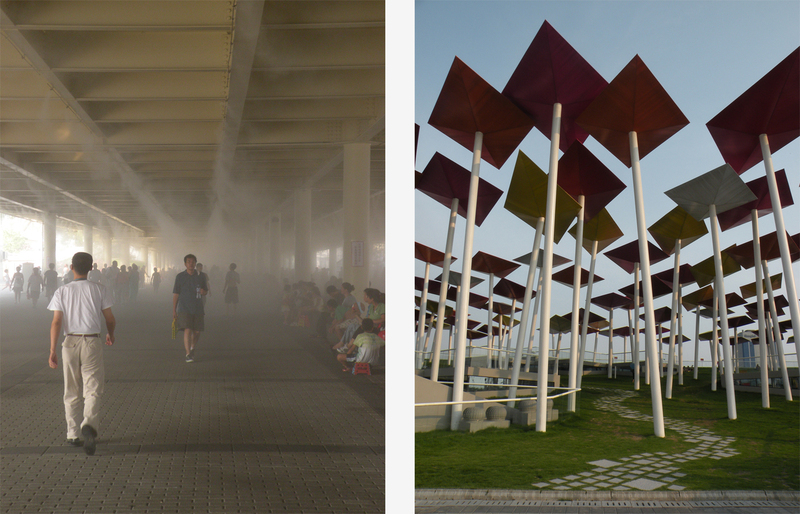 The only respite from this was in the shelter of the pedestrian underpass – here a cool mist of water vapour was constantly sprayed from the ceiling. 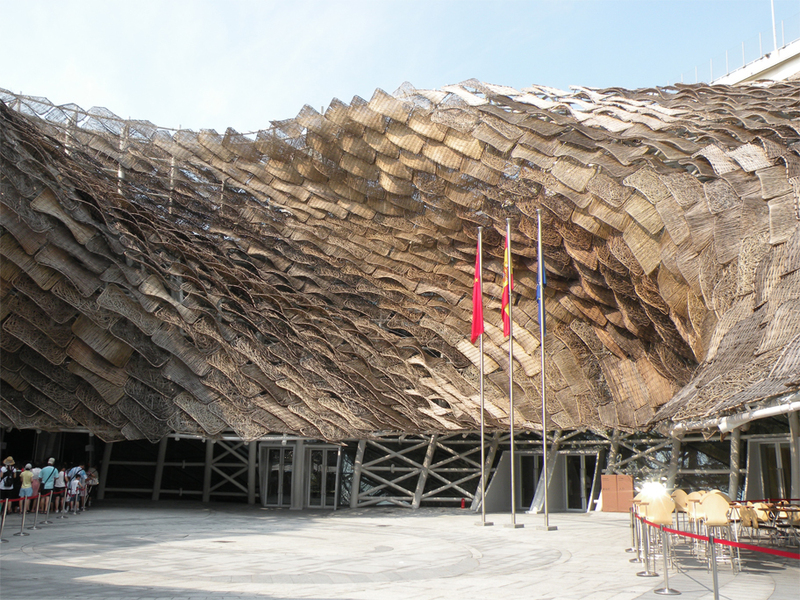 Over the next few days we spent more time cocooned in the air-conditioned indoors than going between the different pavilions. It was just too hot to be constantly outdoors. 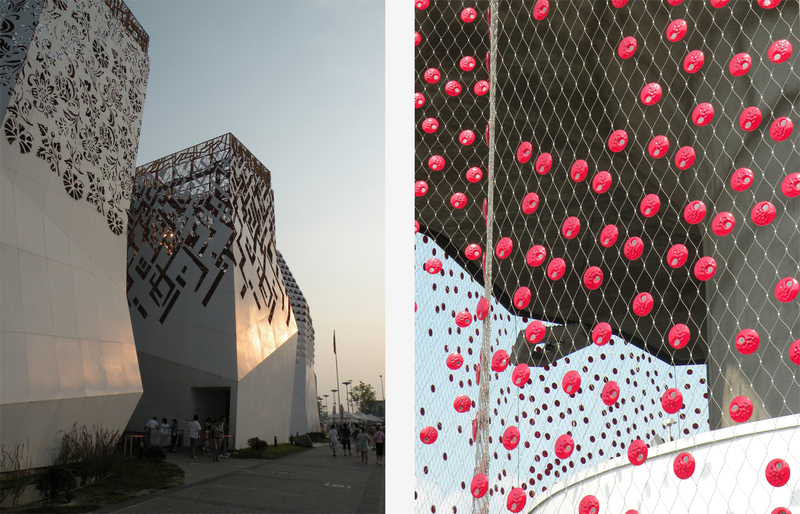 Eventually, on a slightly-less-than-sizzling afternoon, we began our tour with two crowd favourites: the Spanish and British pavilions. Known locally as the ‘rattan basket’ and the ‘dandelion’, these showpieces are well-loved for their distinctive exteriors and the surprises within. 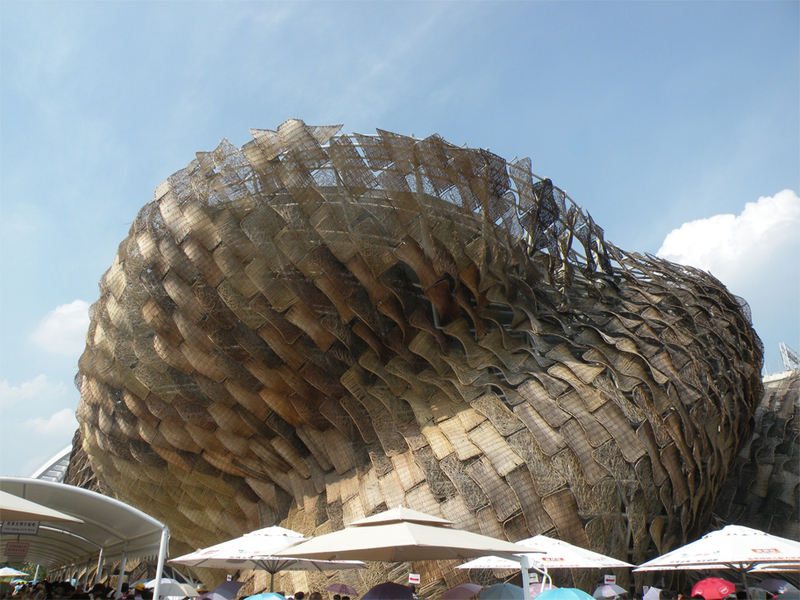 Designed by EMBT, the Spanish pavilion was a patchwork of bamboo mats and a riot of rippling, sensuous curves. 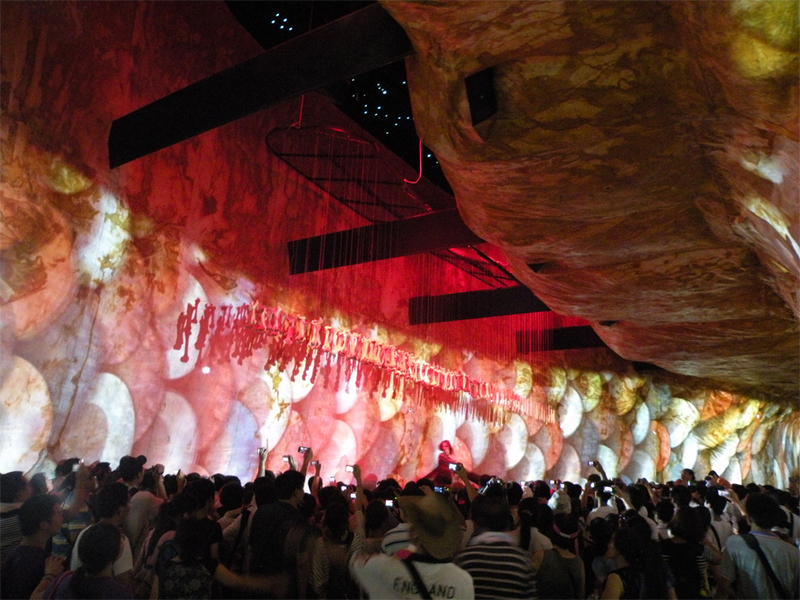 When we entered the exhibition area, we were greeted by a wall-to-wall multimedia display of the Altamira cave paintings amidst an arrangement of hanging bones. On stage a singular flamenco dancer enraptured the audience with her rhythmic movements and sweeps of her abanico. Eventually the dancer disappeared, giving way to a panorama of horses thundering through the plains of La Mancha. 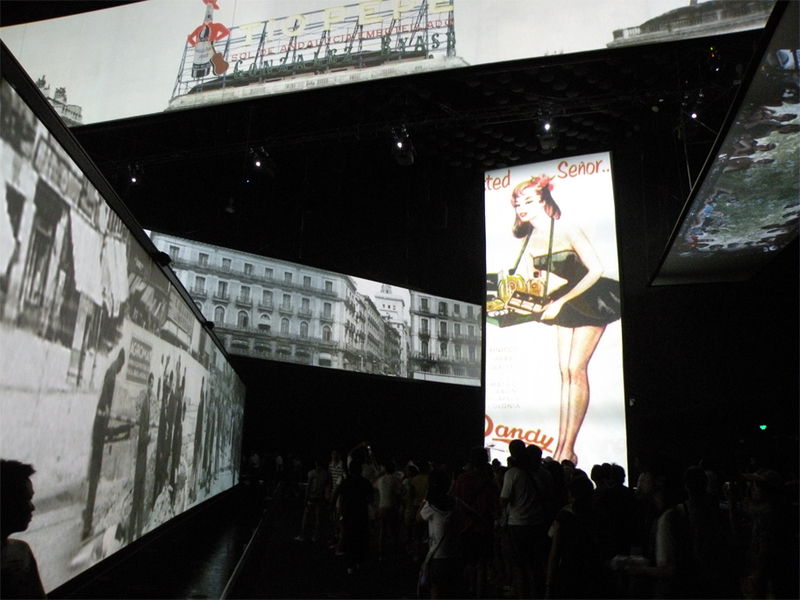 The second room hosted a series of long screens that sped through scenes of Spanish life. Alongside the streetscapes of Madrid, Bilbao and Barcelona, the montage was interwoven with historical photographs and old family portraits. 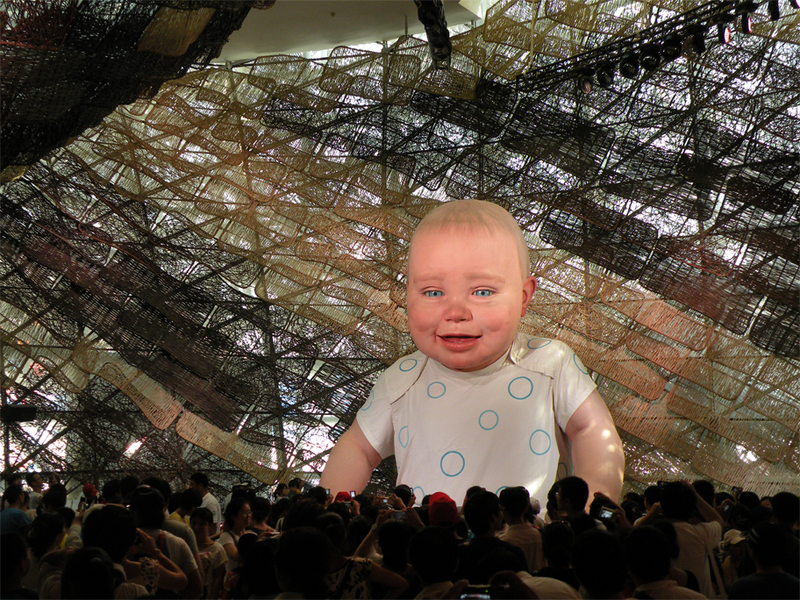 As for the third hall, the pièce de résistance was a ginormous robotic baby. This proved to be a major hit with the local crowd, but my brother and his colleagues were not so convinced – they found it a little disturbing. Perhaps it was its blinking eyes or the remarkable lifelikeness, but for me there was something rather appealing about this giant baby. 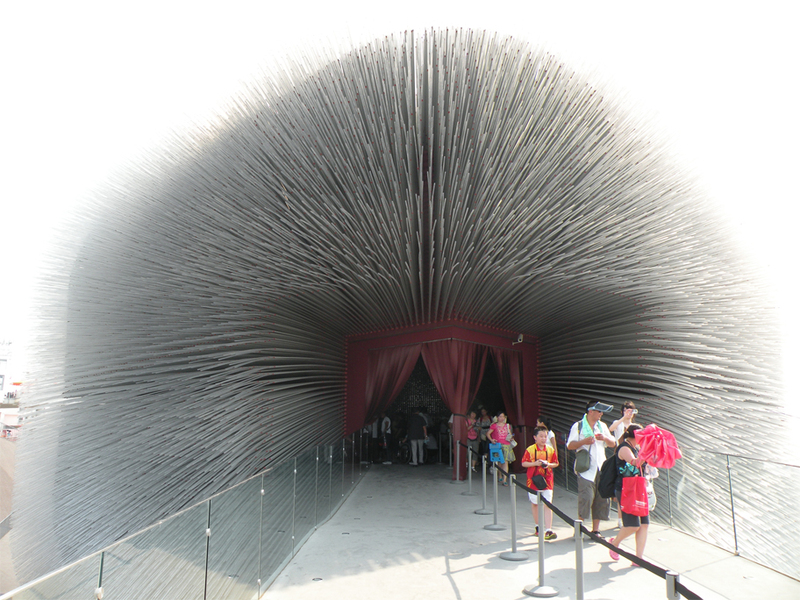 Meanwhile, the British Pavilion by Heatherwick Studio was a testament to some uniquely British traits. 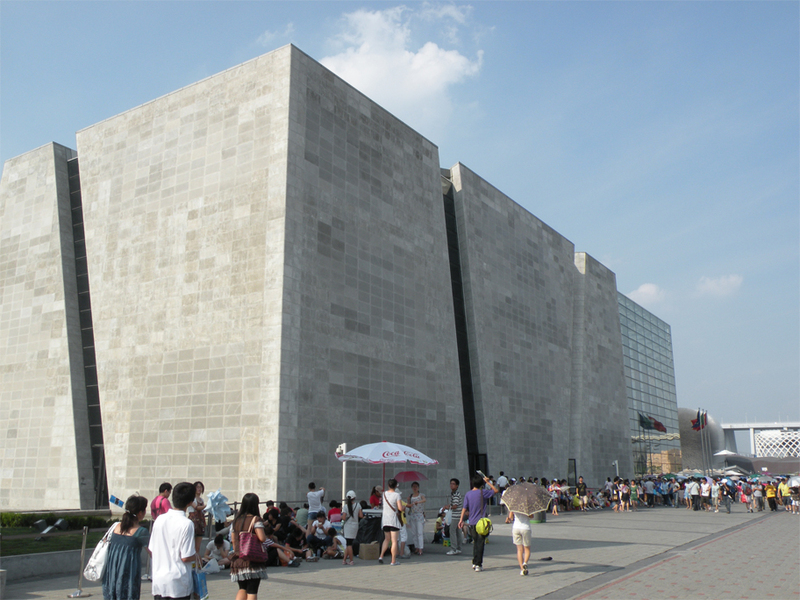 Subtle, eccentric, and understated, the pavilion was less about national promotion and more about the real issues of sustainability. 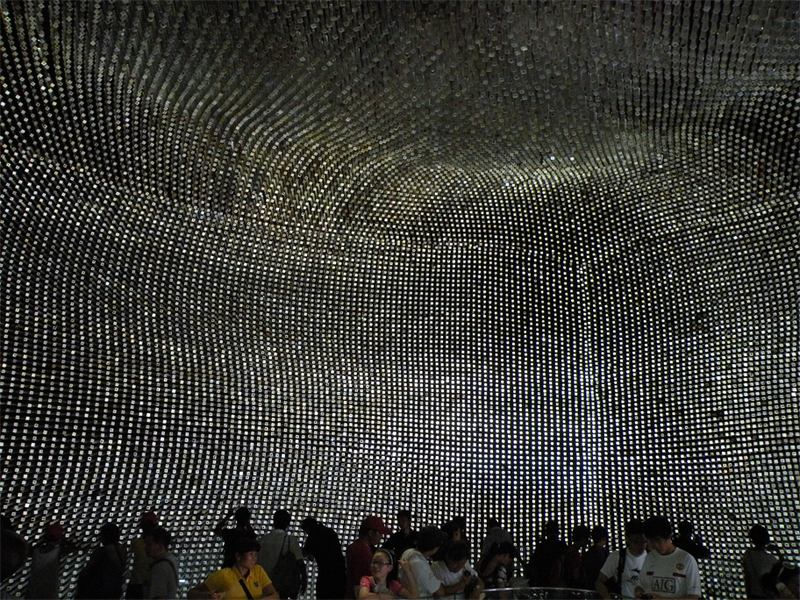 At its core sat the ‘Seed Cathedral’, a surreal structure filled out with thousands of acrylic tubes. 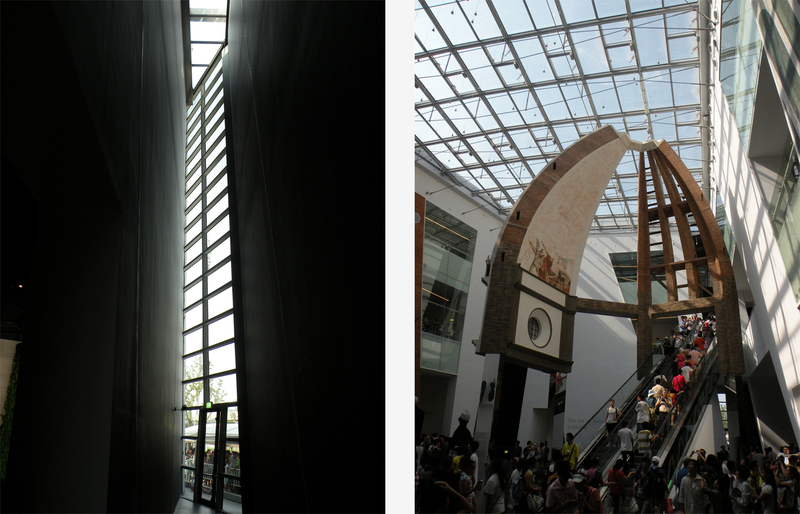 These were designed to channel light from the outside into the heart of the building. 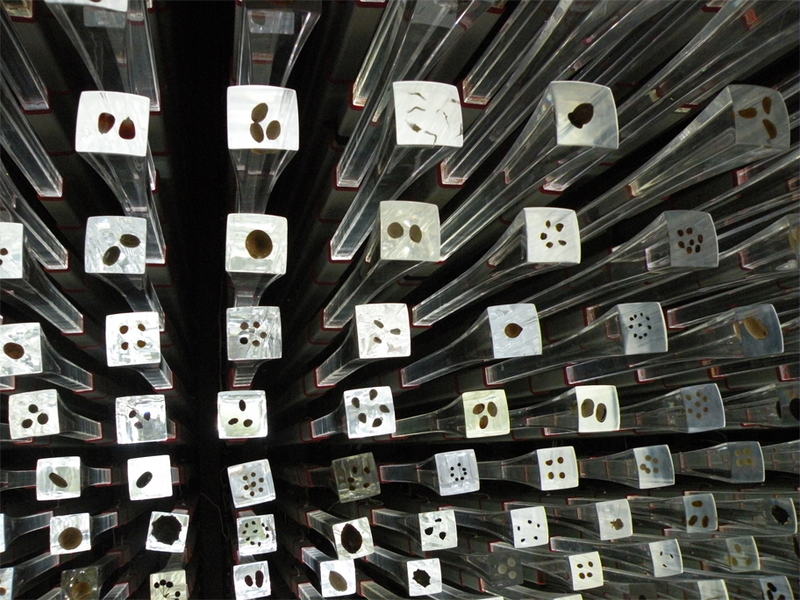 The main exhibit – a vast collection of seeds from around the world – is embedded inside the fabric, with each acrylic tube holding a unique species of plant seed. 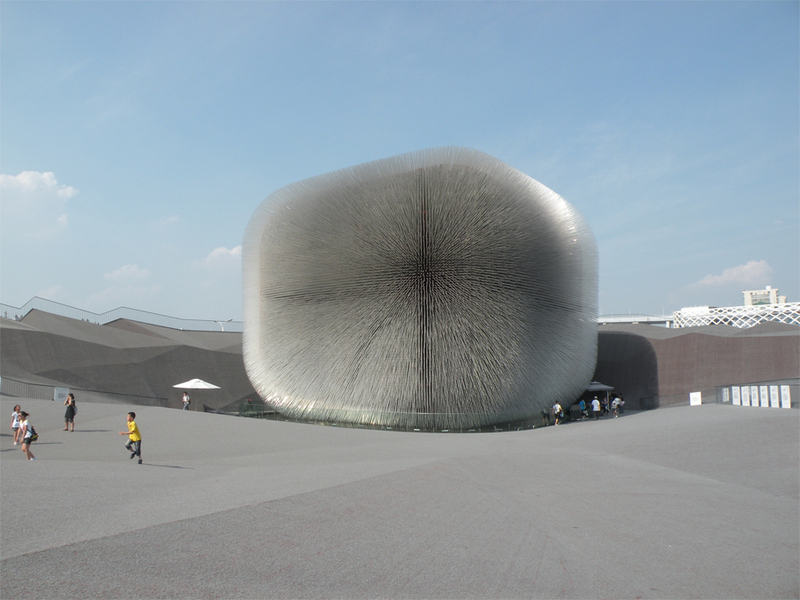 For me, the Italian Pavilion was another favourite. 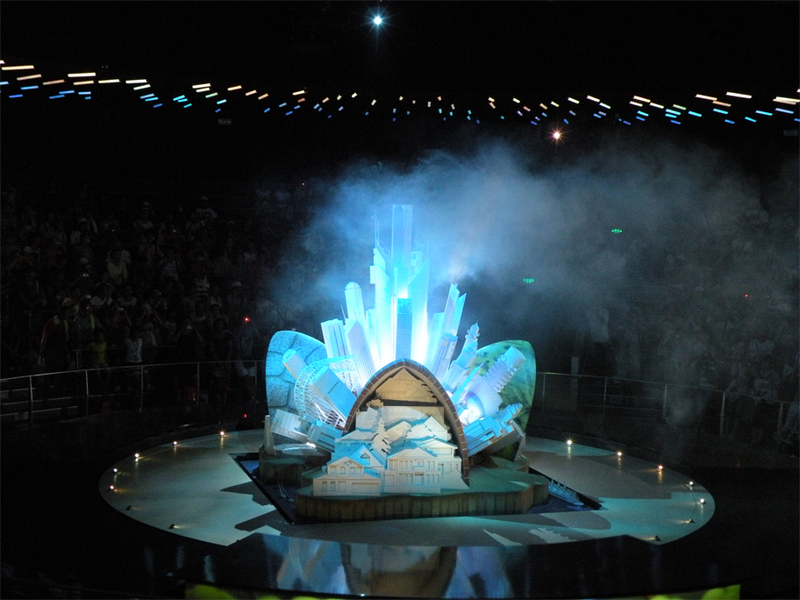 Styled like a modern art museum, it was a comprehensive showcase of the country’s most famous exports. 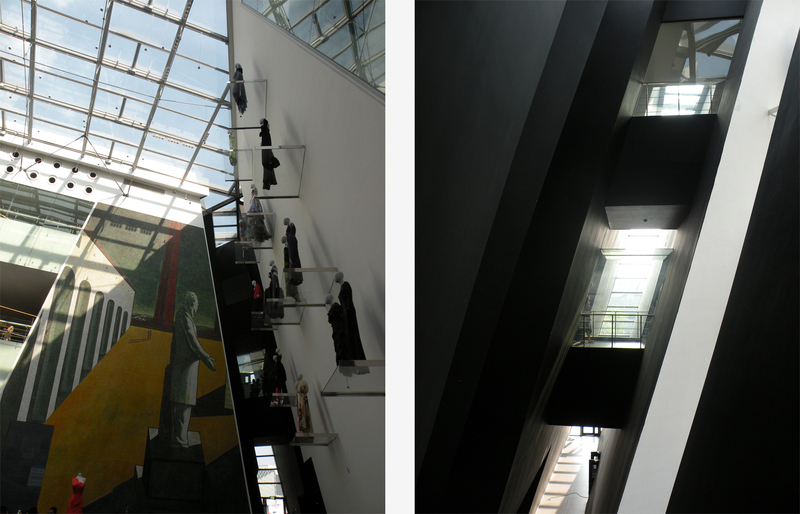 Apart from a complete orchestra set on the wall, the ‘museo’ featured displays on architecture, fashion, beautiful cars, and a hall dedicated entirely to pasta. 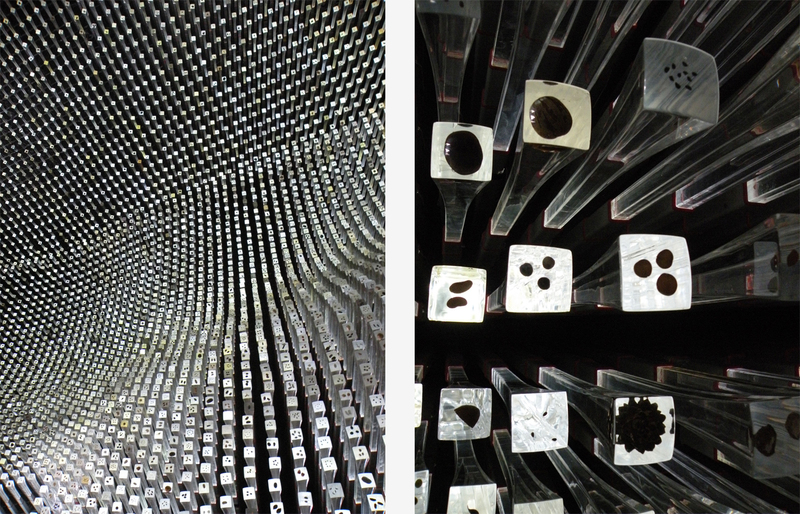 After a while we headed over to the Australian pavilion, a wavy structure clad in corten steel panels, its deep ochre colour a reference to the rock formations of the Outback. 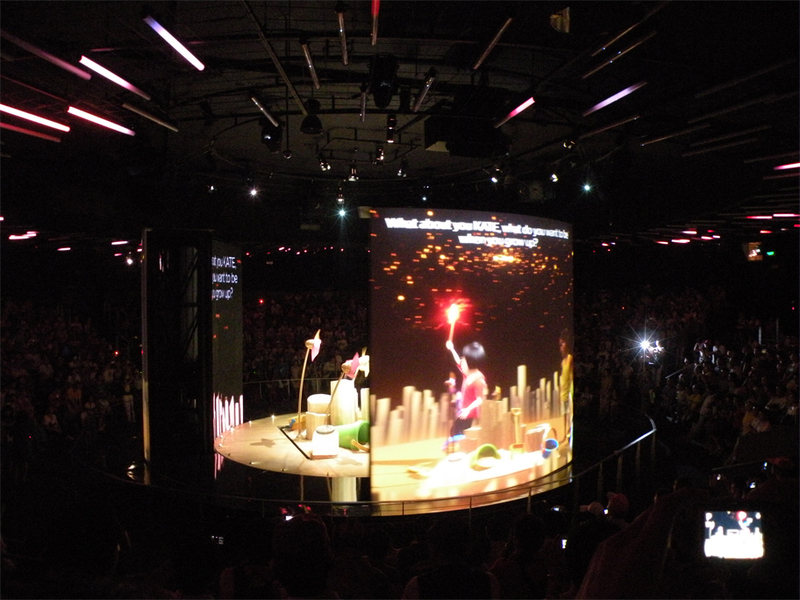 Apart from Aussies making announcements in Mandarin and singing Chinese songs to entertain the impatient crowds, the highlight was a fantastic multimedia presentation at the end, involving colourful floats and a trio of moving screens. 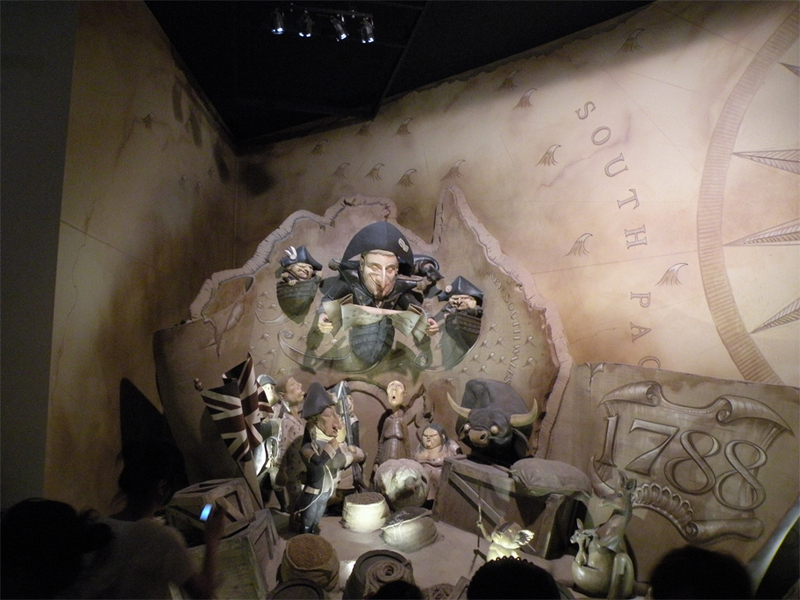 Close by, the Thai pavilion was very down-to-earth; hosting a series of 4D presentations complete with water spray and the smell of tropical flowers, it provided for the most relaxing and cooling experience. 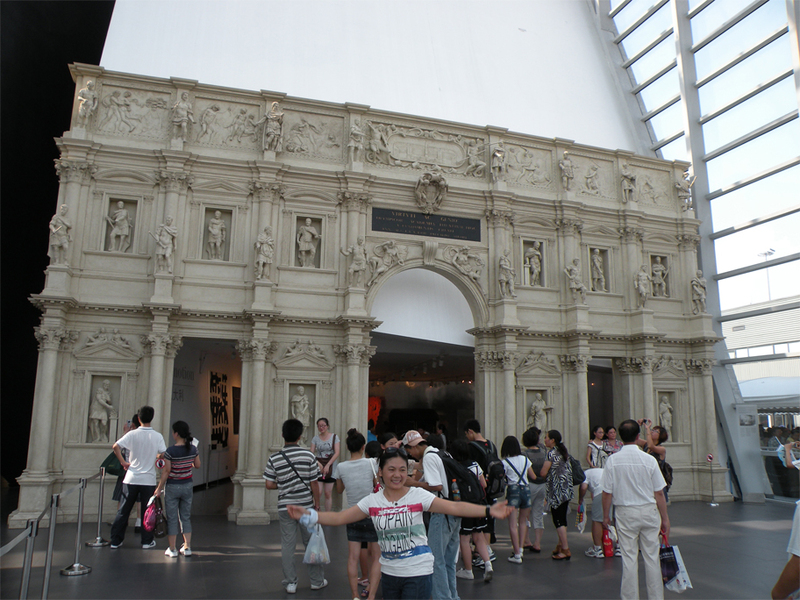 Out of all the pavilions I visited it was perhaps the best one for escaping the heat. When the sun goes down I follow my brother and his colleagues to a nearby restaurant for dinner. Our destination is an unassuming place just off a quiet tree-lined street. In the hot summer air the scene reminds me of the streets of Madrid, particularly the barrio of La Latina. There are 13 of us squeezed around a table in a little room at the back, and we bunch up close together, anticipating a feast of epic proportions. We are passed our individual bowls of steaming white rice, and soon several mysterious-looking dishes are placed onto the tabletop. Alongside edamame beans, steamed chicken and a delicious fish soup, the waitress serves up some raw Shanghai delicacies, including a sort of small freshwater mollusc marinated in rice wine. 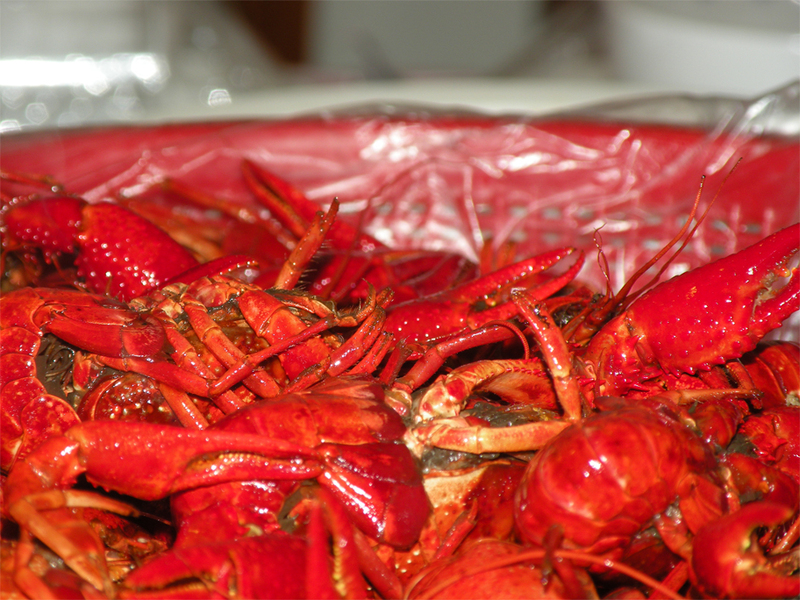 Two baskets of wonderfully spiced crayfish serve as the centrepiece of the meal, and we are topped up with two more baskets of large mantis shrimp. All this is washed down with cold, free-flowing beer. 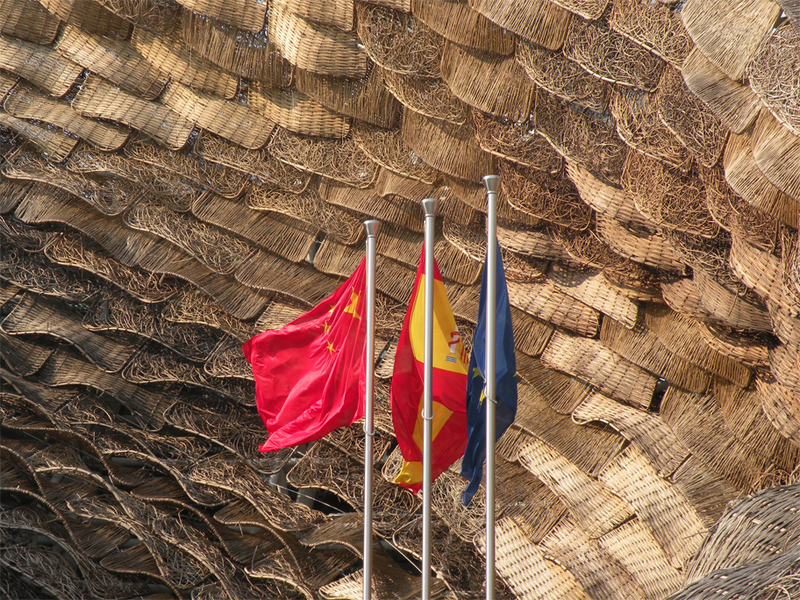 Perhaps I am crazy but I keep seeing similarities between my experiences in Spain and China – good friends, good food, a perfect meal with loud, animated laughter and no pretences. And the best part was the overwhelming sense of optimism. 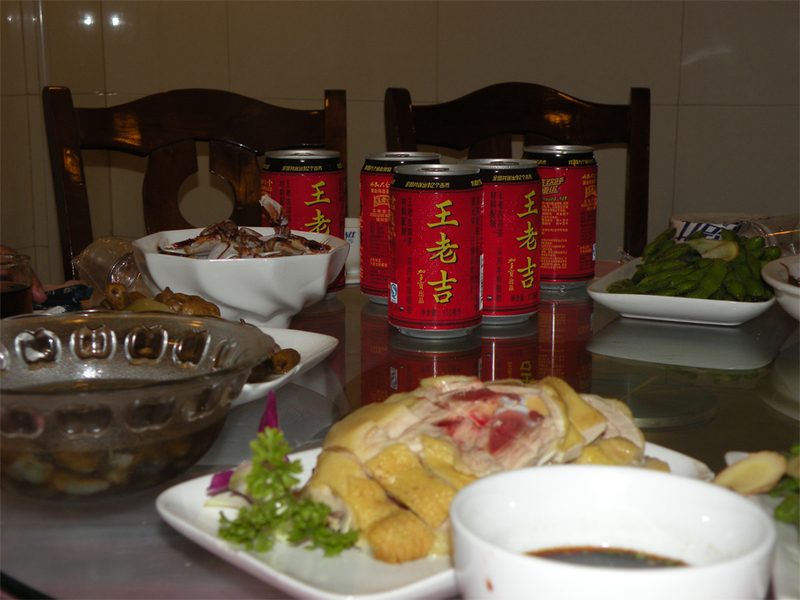 Here in China, despite a range of social and environmental problems, the toasting never ends. ← Not your ordinary jam session, Hong Kong. Not a fan of the gigantababy.